ISLAM whirling derishes | Send an eCard! 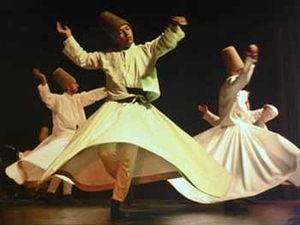 The Mevlevi Ensemble share a whirling dervish performance in Konya, Turkey. This is a spiritual and informative tribute to 13th century mystic, poet and philosospher Mevlana Rumi. The Semazen represents one branch of the Sufi tradition of Islam that focuses on love, tolerance and the worship of God.